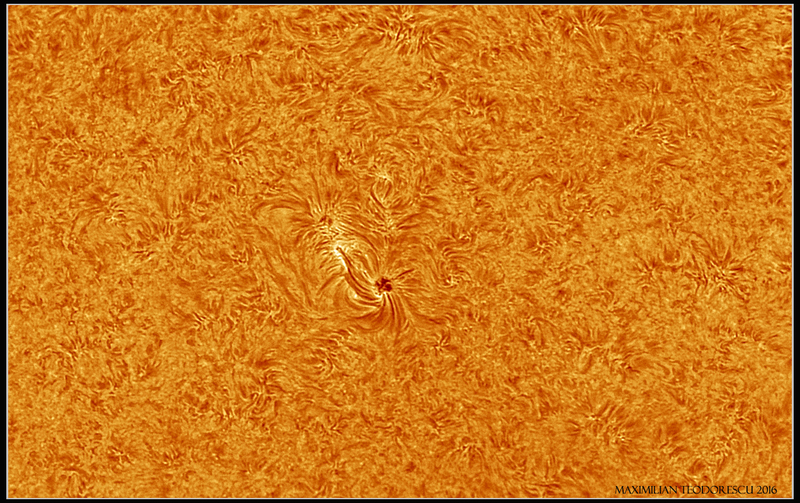 A new very active region is coming into view today. 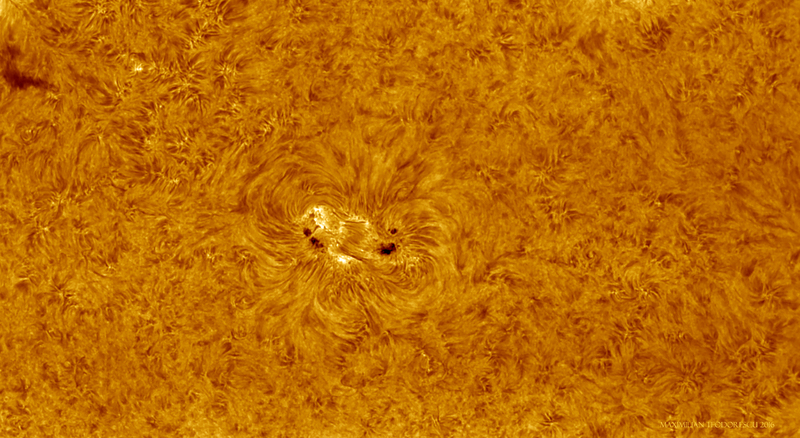 It might give us some nice events like small flares, so it must be monitored. 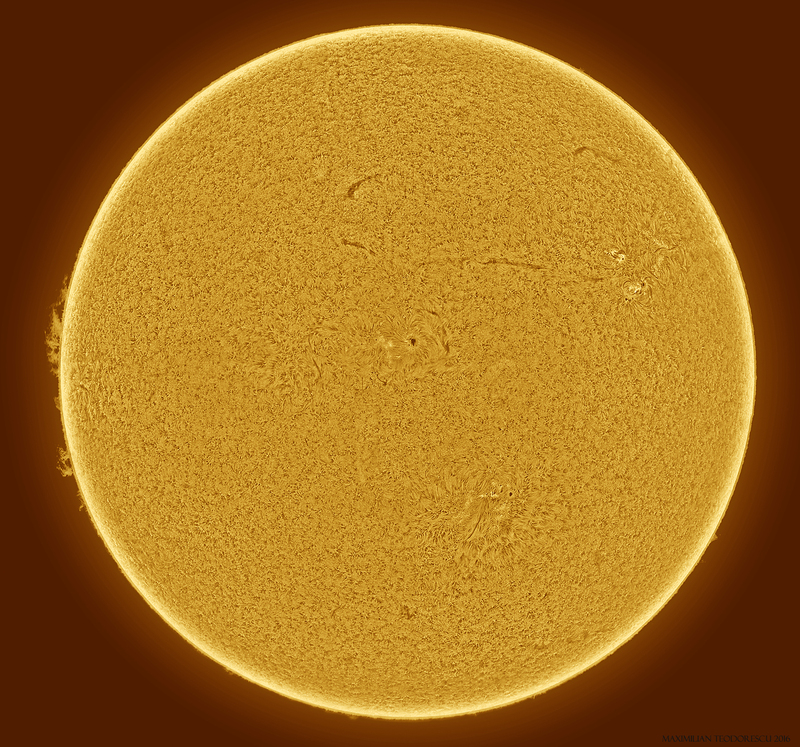 Equipment: TS 115mm F/7 APO Refractor, Quark Chromosphere, Baader UV/IR cut filter, ASI 174MM camera. Seeing: 7/10. 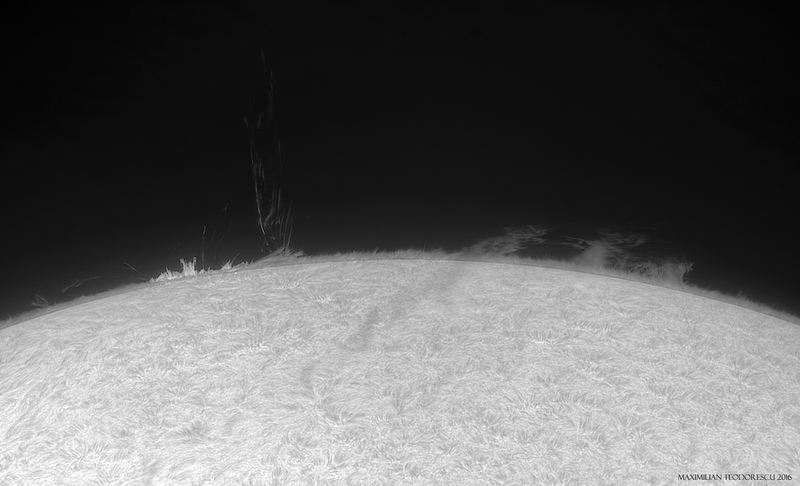 Two very large prominences have appeared today on the Sun, and of course I had to “be there”. TS 115mm F/7 APO Refractor, Baader UV/IR cut filter, Quark Chromosphere H-alpha filter, ASI 174MM camera. 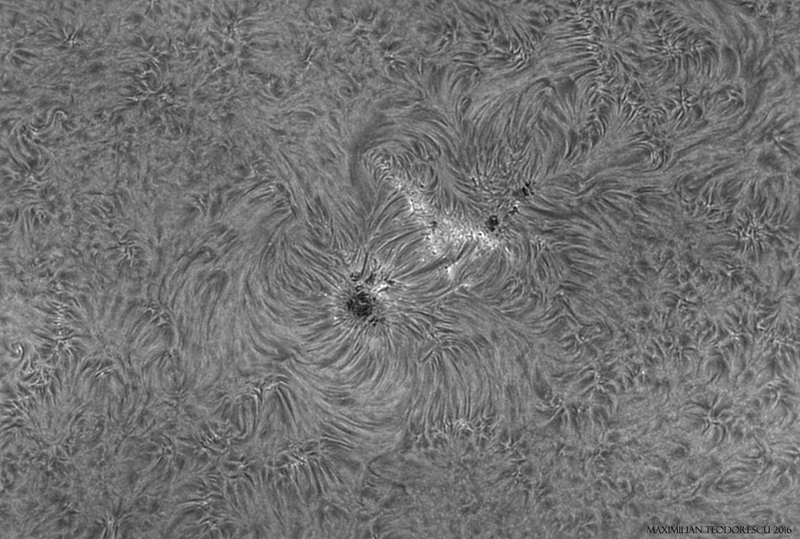 And a full disc image acquired with the TS 65mm F/6.5 APO, a few hours after the above image. 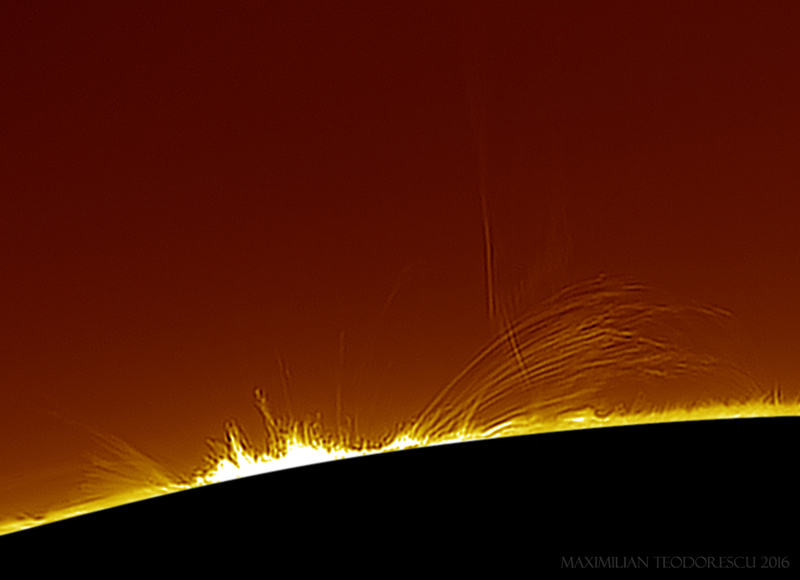 This one was done while preparing together with a friend of mine, Claudiu, for an ISS solar transit. It would have been my first H-alpha ISS transit, but one cloud said “Not this time!”. 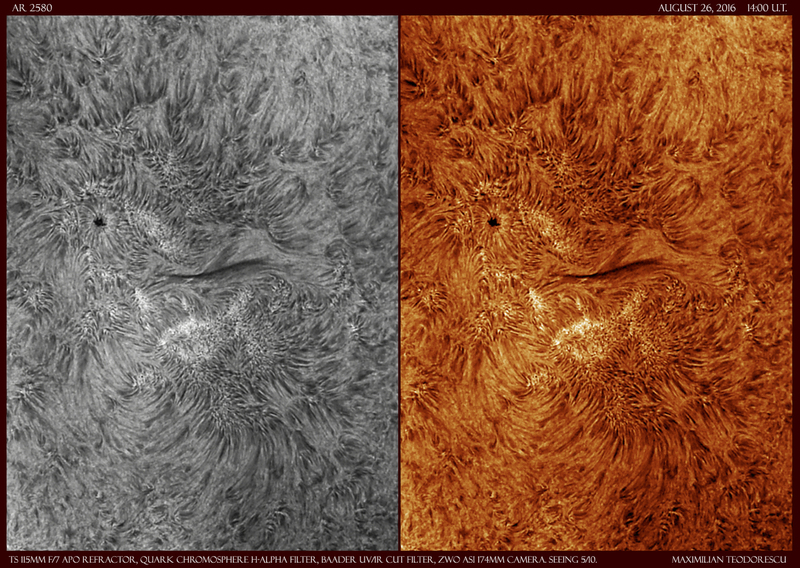 So, I was left with a 12-image mosaic to process, for quite a long time. The end result is more towards an artistic view, since I’ve processed the image with an “inverse limb illumination”for a more…artistic view. 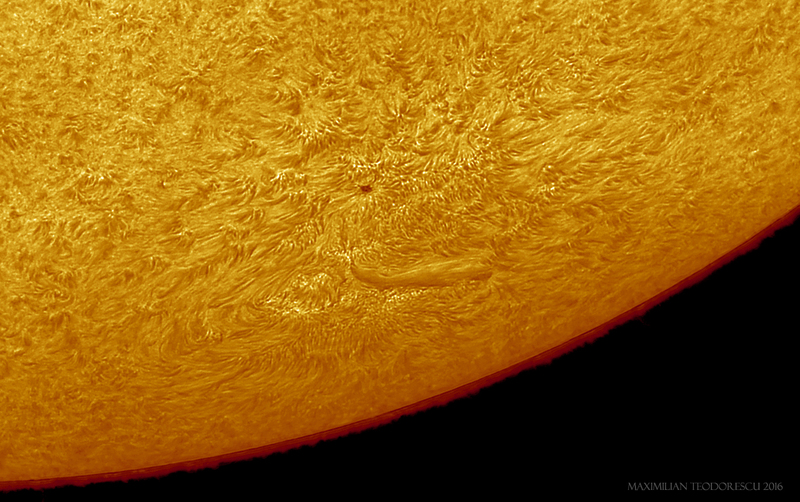 Good activity these days on the Sun, despite lacking any great sunspot group or large prominence. 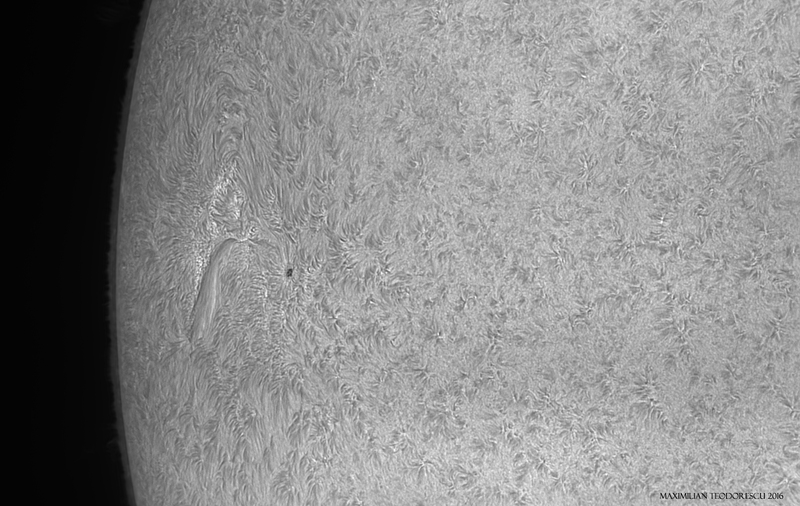 The following shots and animations were acquired under good seeing conditions on an imaging session together with my wife not far from home. 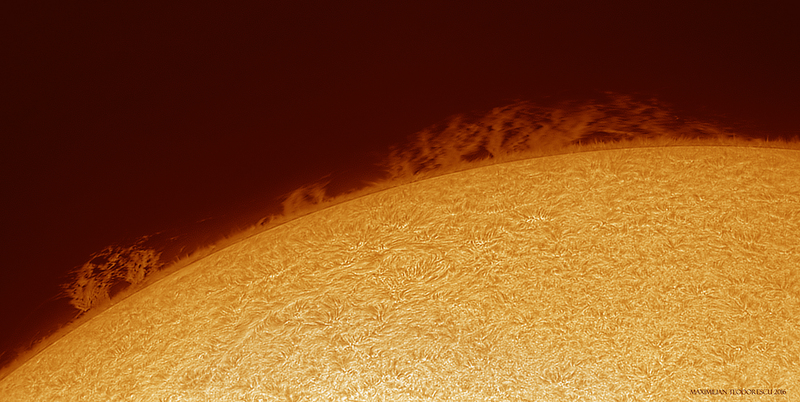 The equipment: TS 115mm F/7 APO Refractor, Quark chromosphere H-alpha filter, Baader UV/IR cut filter, ASI 174MM camera. The prom has change a lot in appearance. A short animation is also being processed. 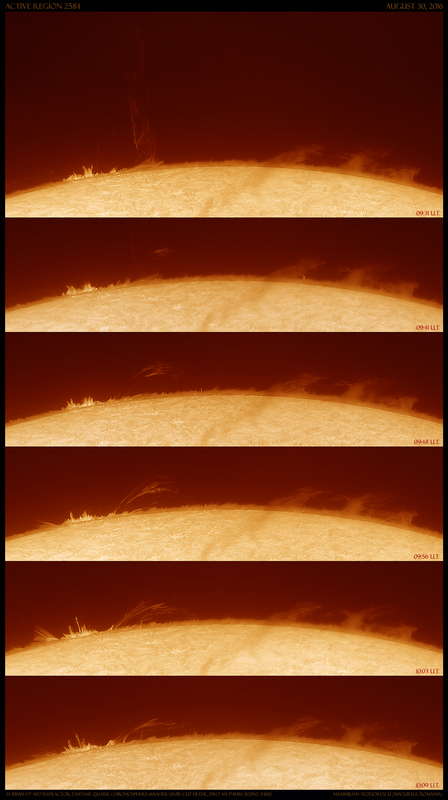 A few shots from today, showing one very fast changing prominence and an interesting Active Region. TS 115mm F/7 APO, Quark H-alpha chromosphere filter with UV/IR cut filter, ASI 174MM camera. Again, some H-alpha shots. Mostly these were acquired as tests in an attempt to reduce the field uniformity due mostly to the camera used for the acquisition (at least I think this is the reason). 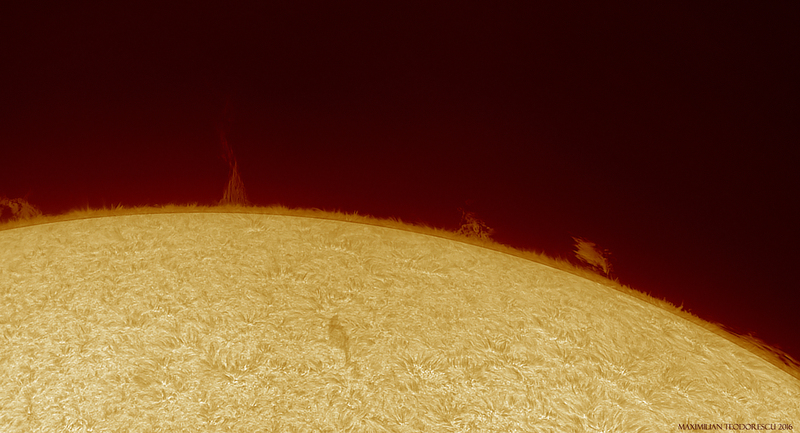 Equipment: TS 115mm F/7, Baader UV/IR cut filter, Quark Chromosphere, ASI 174MM camera. 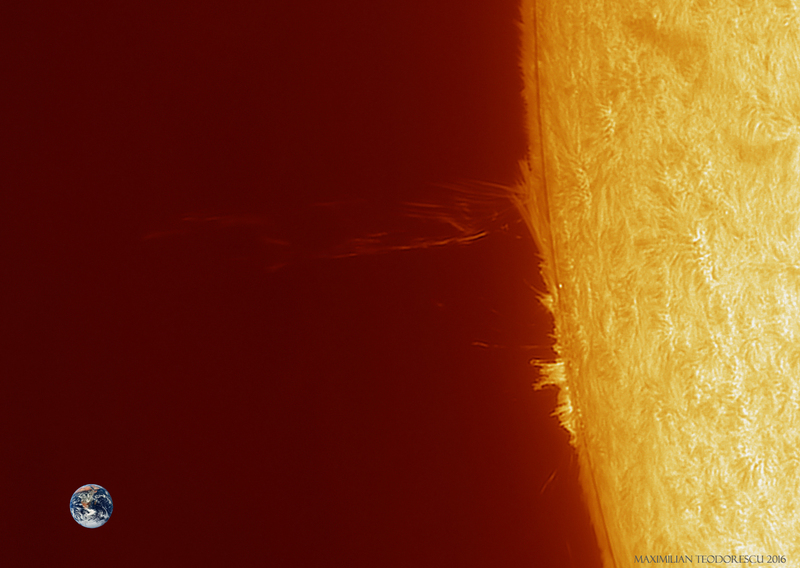 Again, some activity on the Sun’s limb with a few large proms. 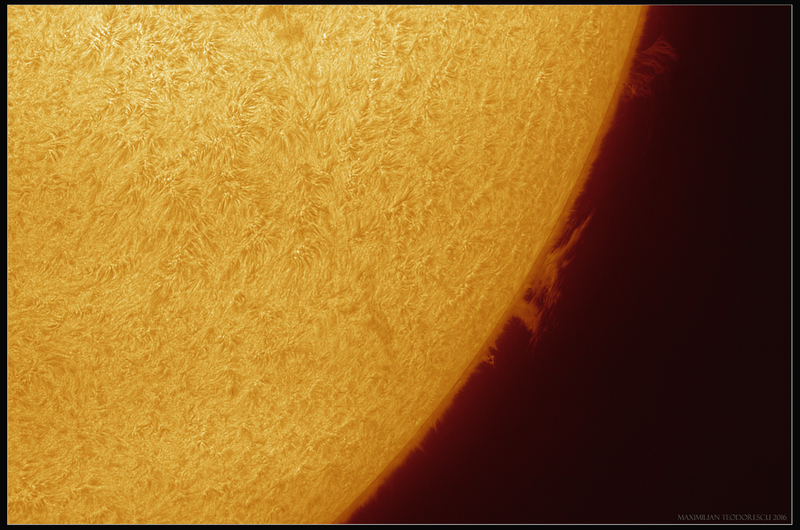 Equipment: TS 115mm F/7 APO Refractor, Quark Chromosphere H-alpha filter, Baader UV/IR cut filter, ASI 174MM camera. 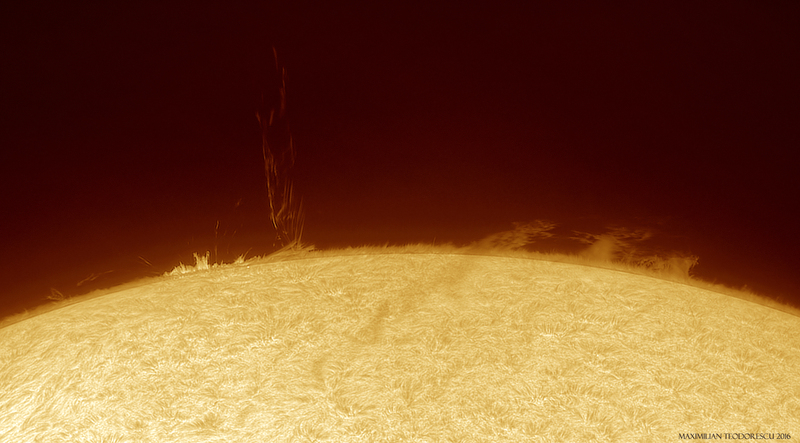 700 out of 4000 frames. Seeing 5/10.